OpenAgile is similar to Scrum in many respects. Both are systems for delivering value to stakeholders. Both are agile methods. Both are frameworks that deliberately avoid giving all the answers. So why would we choose OpenAgile over Scrum? The most important difference is in applicability: Scrum is designed to help organizations optimize new software product development, whereas OpenAgile is designed to help anyone learn to deliver value effectively. applicability over a larger range of team sizes from a single individual on up. Search, Love and Courage. Scrum acknowledges a separate set of qualities, but does not show how they systematically connect with the requirements of a Scrum environment. environment. OpenAgile also provides a framework to include additional types of work beyond these five. Improved role definitions based on extensive experience. There is only one role defined in OpenAgile (Team Member) vs. three defined in Scrum (Team Member, ScrumMaster, Product Owner). There are multiple paths of service that allow Team Members and Stakeholders to engage with an OpenAgile team or community in different ways. There are five paths of service: Process Facilitation, Growth Facilitation, Tutoring, Mentoring, and Catalyst. is responsible for all aspects of growth including value (like the Product Owner), and individual and team capacity building. From Crystal: creating a safe work/learning environment. From Lean: build quality in, value stream mapping, root cause analysis, standard work. unsuitable for operational work and general management. The distinction between Commitment Velocity and other uses of the term “velocity” used in Scrum. Commitment Velocity is the historical minimum slope of a team’s Cycle burndown charts and determines how much work a team plans in its Engagement Meeting. Flexibility in the length a Cycle. Scrum requires that Sprints (Cycles) be one month in duration or less. OpenAgile allows a Cycle to be longer than that and instead provides a guideline that there should be a minimum number of Cycles planned in the time expected to reach the overall goal. The Progress Meeting in OpenAgile does not require people to take turns or directly answer specific questions. Avoiding conflict-oriented models of staff and management (Chickens and Pigs in Scrum). method that has a specific structure for community involvement that allows for continuous improvement of the system. Scrum is closed. It is closely managed by it’s founders and this has led to challenges with the method becoming dogmatic. OpenAgile is meant to constantly evolve and grow. There are two things every leader needs to know to be successful: first, a leader must clearly articulate what they expect, and second, they need to inspect what they expect on a daily basis. The big challenge though is how do you stay on top of changing priorities? And how do you avoid micro management and driving your team crazy? This is why OpenAgile, in my opinion, will be very quickly embraced by management teams around the world. It has all the necessary tools to ensure success. For the past 6 months, I have been working with a financial services team in Slovakia to introduce them to Agile methods. I started with Scrum, a methodology and framework that has been used in the Information Technology sector for the past 5-10 years. The Slovak team started using Scrum with one team of 6 managers. They grew to have 4 teams actively managing their activities and projects using Agile Scrum, and another 2 teams are planning to launch soon. The feedback from the team members has been positive and the team leader is very impressed with the methodology, the activity levels, and the results. This organization/structure is doing very well in the very competitive marketplace that is Slovakia. I interact with the teams on a regular basis and often travel to Slovakia from Canada on business, so I have the opportunity to work closely with the structure, leader, and the teams. The only challenge with Scrum is that it is somewhat restrictive regarding the types of work that is recorded and reported upon. Scrum does not accommodate repetitive or calendared activities. 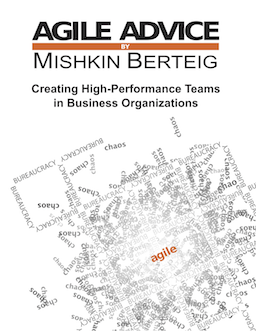 Fortunately, Berteig Consulting has developed OpenAgile as a new Agile method that allows for the tracking and reporting of all the Scrum work activities plus these new categories. I find OpenAgile more inclusive and representative of the Financial Services work environment. I’m now in the process of transitioning the Slovak teams from Scrum to OpenAgile. I believe OpenAgile will be a much better methodology for this team, and for all non-IT organizations, as it creates an environment for teams to achieve even greater success. The OpenAgile method teaches the team members to self-manage. And rather than replacing the role of the team leader, that person is empowered to truly lead because they are free to focus on creating an environment where the team can thrive. OpenAgile helps the team to clearly identify the key strategic and tactical goals, and it allows the team to systematically inspects what everyone expects to be done.